Perhaps the most tragic story in Dear Boy concerns the death of Neil Boland, under his Bentley, during a fracas outside a Hatfield pub on Sunday January 4, 1970. Keith Moon was subsequently charged with being behind the wheel of the Bentley at the time that Boland was crushed to death, and several youths were later charged with causing an “affray.” The story is described in detail in Dear Boy, Chapter 19, pages 251-256, drawing largely on the memories of Kim Moon and ‘Legs’ Larry Smith, two of the four passengers in the Bentley that night. In the middle of 2003, Neil Boland’s daughter, Michelle, just three years old at the time of her father’s death, made contact with me. Dear Boy, apart from describing her father’s demise in painfully graphic detail, had awakened in her a determination to find out what really happened that night, to which end she had tracked down Peter Thorpe, one of the five young men found guilty of the “affray” that led to Boland’s death. After an exchange of e-mails, she met Thorpe in a Hatfield pub and came away convinced that there was another side to the story. After we corresponded for a while, Michelle put me in touch with Thorpe, who I spoke to by phone for the purpose of this Afterword. He was 19 years old at the time of Neil’s death. Details of that interview are included in the Afterword to the New Edition. Thorpe paints a picture of local lads out for an evening of fun, provoked into a fight with Neil Boland. Adamant that he and his friends were not the ‘skinheads’ they were portrayed as (both in the press at the time and subsequently in Dear Boy), Thorpe also believes they were made scapegoats for Neil’s death, and that those in the Bentley were equally culpable. Shortly after going to press on the new edition, and thanks to an iJamming! reader, I talked to the last surviving passenger from the Bentley that evening, Jean Battye. Jean was ‘Legs’ Larry Smith’s girlfriend at the time; she is referred to several times as such in Chapter 19. Jean, Larry, and Kim Moon each have highly similar memories of what transpired that place. Indeed, at times while talking with Jean by phone, I wondered if she was merely recalling the tale as told in Dear Boy, but at other points she very clearly took the lead and directed the conversation. I regret that I was not able to include Jean’s interview as part of the 2005 Afterword, but I am happy to print it here in full. I doubt that there will ever be unanimity regarding the tragic events of that night, but I hope Jean’s account helps paint a clearer picture of what took place. Jean was able to help answer one key question: why Keith ever agreed to help ‘open’ the disco at the Red Lion that night. It was apparently as a favor to John Mears, who is referred to in Chapter 20 as the son of Ron and Yvonne Mears, Keith’s neighbors in Winchmore Hill with whom he went into partnership on the Crown and Cushion Pub in Chipping Norton. Indeed, following Neil’s death, Keith hired John as his personal chauffeur. The Mears family had a history of involvement with public houses; whether John Mears was personally involved in the disco at the Cranbourne Rooms or just trying to help out his own friends, Keith agreed to attend the ‘opening’ as a celebrity. With tragic results. Dear Boy is available from amazon.co.uk and amazon.com. 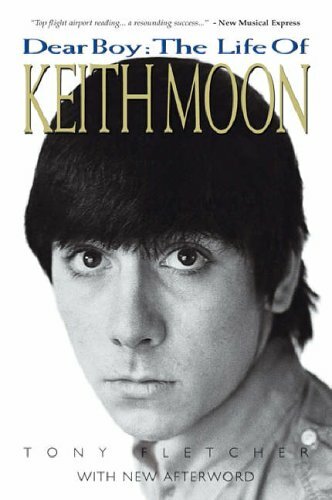 More Keith Moon at iJamming!, including interviews with Jeff Beck, Dave Edmunds and Alice Cooper, can be found here. 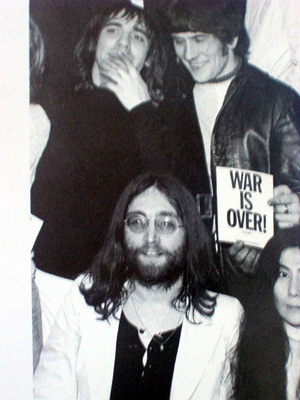 Keith Moon and Neil Boland backstage at John and Yoko’s War Is Over concert, the London Lyceum, Dec 15 1969, just two weeks before the incident where Keith ran over Neil in his Bentley. -Tony Fletcher: You were with Keith and Larry in Hatfield that night when Neil tragically died. Did the book seem like an accurate portrayal of the events. Jean Battye: I can only remember my part in it. Which is, that we didn’t particularly want to go. Yes. But Keith had promised John and Yvonne that he would do it. -John and Yvonne the owners of the pub? They lived opposite in Winchmore Hill. They owned the Crown and Cushion. Now, they weren’t with us that evening; it was just the four of us and Neil. We got to the place and we hadn’t really been given much of a brief as to what it was. But as soon as we got there we realized it was exactly the sort of place that we tried to avoid. They weren’t even people that were going to be particularly pleased to see Keith. And there was quite a lot of backchat from the minute we walked in. Keith was, as he always was, unmoved by all that, bought lots of drinks. Then Larry and I had a big row. Larry went out to the Bentley, and Neil persuaded me to go out and make it up with him. -So you had a row inside the place? Larry and I did. I was really uncomfortable there and I was fed up with Larry for some reason. I remember Neil persuaded me – he was such a sweet man. He persuaded me to go out. So I was actually in the back of the car with hi,. It was really cold. And I think there was frost everywhere. We had to wait a long time. Keith had done all the right things by the people in there. He’d done all the things he was meant to… for John. Oh, no. We just turned up. And to our horror, found that it was the sort of place that it was. And part of the trouble was around the fact that Keith always drank brandy. I never saw him have a half pint of bitter or anything like that. And when you go into a place like that and you have brandy, it all adds to the sign of what a snob he was. They didn’t use those words. …”Large brandy, dear boy.” Which is exactly what Keith would say to anyone who asked him if he wanted a drink. -And for young working class kids, that would have been the price of four drinks. Keith certainly didn’t expect anyone to buy him drinks. And he wasn’t showing off or anything like that. He was just being Keith. But it wasn’t a happy atmosphere at all. I can’t remember what he did now – whether he was playing records or whatever. We were in the car anyway. And whilst we were there, a lot of people kept coming round and looking at the car. I mean, you see cars like this all the time now but in those days it was quite extreme. And they were making comments about what a flash motor it was. The atmosphere really was not good at all. Then Keith and Kim came out with a great mass of people around them. And there was a lot of nasty sort of insults going on. ‘”Large brandy, dear boy.” … exactly what Keith would say to anyone who asked him if he wanted a drink.’ Jean Battye recalls Keith’s drinking habits. Yes, but he didn’t want to let anybody down. He didn’t want to let John down and he didn’t want to let the kids there down, because they were an audience. And Keith was immensely committed to doing a performance. -So he would have stayed there till closing time, which, if there’s going to be trouble, is usually when it happens. Yes. So Keith and Kim got in the front. And I think Keith was between Kim and Neil. Then there were a lot of comments again about the car, and “who do you think you are?” And then there was this howling mob… and money being thrown, that’s right – coins being thrown, a really nasty atmosphere. -This is while Neil is trying to drive away? This is when we got in the car. Before we actually started they were all over the car. Neil was trying to drive out – and this is the bit I can’t remember very well except then that they were all over the car and they were rocking it and trying to turn it over. And I did think at one time that it was going to go over. -And that part is a clear memory for you? Yes, I can remember that very well. And I remember Larry saying ‘Lock the door’ and then the next thing was that Neil’s door opened. There was this howling going on all the time, and more insults. It just didn’t stop. Now whether Neil got out to remonstrate with them, or clear a path or what, I don’t know, or whether the door was opened and he was pulled out, but it happened so quickly. And then they were all over the car again, and I just remember Keith sliding in to the driving seat and driving out of the car park and on to the road. And then they were all round the car again. He drove just up the road until he came to a place on the left where there were houses set back quite a long way from the road with lights on. -Was that a Trades Club? -So he’d been dragged the whole way down the road. Yes. And then, I don’t know when it actually happened, but when we were taken down to the police there was a power cut. It was really very menacing. First of all they told Kim that Neil was in hospital and they wanted her to identify him. And I was saying to them, ‘Well, why does she need to identify him if he’s alive?’ We were already terrified that he was dead. But nobody would tell us. They just kept saying they wanted us to identify him. Keith was taken away into another room. And there was a power cut. And I remember Larry shouting. They’d put him in a separate room. And then I remember them taking us somewhere else by car. -Would it have been from Hatfield to Welwyn Garden City? Probably. I really don’t know. What I remember was there was a journey in a car. And when we got to the next police station, Keith had been taken away, his shoelaces had been taken away I found out later. And I was interviewed by someone who must have been quite important. I had a feeling that they had these jodhpurs on, thigh length boots, whether they’d been at some ceremonial dinner I don’t know, but it certainly wasn’t ordinary police uniform. They got people out who were pretty senior. And I can remember him saying to me, because I was a teacher, “What are you doing mixed up with these people?” And I was really upset. I thought they were lumping us all together. Anyway, this guy was very patronizing now I look back on it now. I remember saying our friend had been badly hurt and we’d been attacked by this mob that had tried to kill us, and they didn’t seem to have got the picture at all. But from them on it got better. I think Larry got on to the lawyers – Kit Lambert probably. They sent someone down and the next thing I can remember is we were all taken back to Winchmore Hill. I know I was there when Neil’s family came down. -Were Neil’s family pointing blame at anybody? No, not then. I don’t know if that changed later on. The next morning, I’d never seen anything like it, because the garden was full of reporters. I had to phone up and couldn’t go back to school. -The newspapers reported and Larry said this at the time I interviewed him, that the troublemakers were primarily skinheads. Did you get that impression? And the reason I ask is that when I finally tracked down one of them, he insists they weren’t skinheads. Well I can remember Larry saying when we drove into the car park, ‘Oh God, it’s a skinhead pub.’ That was certainly what Keith, he and we all thought. Because if we’d known it was like that we’d never have gone. That’s what’s always gone through my head. From when we first drove up to the Pub. -Did you get the impression that these were kids out to cause trouble, or they were simply not your group of people? It was the last place we should have gone. We were walking into the opposition camp really: a) We didn’t think they would think much of Keith, they were a lot younger and not his type of audience. And also, and I assume it was from the way they were dressed, it was not our of scene at all. I didn’t even know if they would want to see him as a … he was a big pop star but they might have thought he was a bit naff because he wasn’t their style. -They might not have been star struck… Like, who’s this rock star coming down to impress us? And I don’t remember John being there, you see. That was the big problem. If John had been there, or come down with us, whoever his contact was at the Pub, he could have sorted it out. But I don’t think was there at all. -The newspapers reported them as skinheads. The people arrested were very young and a couple were too young to have them names in court. The others were welders and builders. What I can remember now, and what was surprising at the time was, by the time we got to the police station, they’d already managed to pull people in. You see, by the time the police got to the car, they’d all gone. But by the time we got to the police station, there were a good half a dozen to twelve people they’d pulled in. They must have known where to get them. When you say “came up in court” I wasn’t aware it had gone very far in court. I came up from Brighton to give evidence, but when I got to the station in Victoria I was told it wasn’t necessary, because they’d pleaded guilty. He literally thought he was saving our lives by driving us out of that car park. -And you remember him being the one who slid over into the driving seat. -You mentioned earlier that the Bentley was big enough to sit three people in the front. Yes. It had a long bench seat. -So it went, Neil, Keith, Kim. It must have done. I can’t imagine how… that would have been a normal way of seating. If he were on the outside to start with, he would have had to lean over to take control. -Because you specifically remember it was Keith who leaned over and started driving the car? -Larry said to me that he leaned over from behind and helped steer the car. It was an absolute panic. -So there were three different court cases. Keith got an absolute discharge. I have to say that in all the other times I’d known him, I’d never seen him once drive. Or try to drive. Except round the grounds of his place in Chertsey. But did they mention trying to rock the car over? You see, they definitely did. I’d say that the atmosphere was pretty poison before I came out of the place. Kim was a very gentle, mild person. I honestly don’t remember her doing anything like that. I do remember jeering the minute they walked out. -But you’d been out in the car for long enough by then. -So during that time that you’re out there. Neil has suggested you go out, it’s just you and Larry and Neil is trying to look after Keith in the pub? -So you’re not feeling desperately safe, the two of you locked in this flash car. No. I remember thee people saying “This is his car, let’s kick its headlights in.” It wasn’t just when Keith came out that it started. It had been building up all night. There had been remarks like that while we were sitting in the car. May 2013: John Mears made contact with me upon reading this interview to state that “it was my father Ron, not me who asked Keith to open the Red Lion Disco that night.” Duly noted.